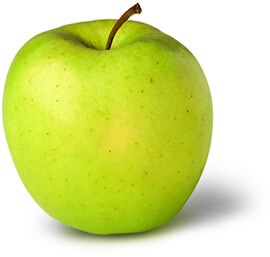 An apple a day keeps the doctor away, literally. New research from the University of Iowa (UI) shows that a natural substance found in apple peels, ursolic acid, may actually reduce the risk of obesity and obesity related diseases. Christopher Adams, UI associate professor of internal medicine and a Faculty Scholar at the Fraternal Order of Eagles Diabetes Research Center at the UI led the research which was published on June 20 in the journal PLoS ONE. There was previous research which acknowledged that ursolic acid increases muscle mass and strength in healthy mice. “In this study, we tested ursolic acid in mice on a high-fat diet --a mouse model of obesity and metabolic syndrome. Once again, ursolic acid increased skeletal muscle. Interestingly, it also reduced obesity, pre-diabetes and fatty liver disease,” Adams states. Ursolic acid helps increase muscle mass, muscle burns more calories than fat, ipso-facto ursolic acid could help reduce obesity. Ursolic acid was also shown to increase the amount of brown fat in the mice. Brown fat is seen in infants and hibernating mammals. Its main purpose is to ward off hyperthermia. In infants, it is located normally around the neck and shoulder blade area but has been known to dissipate with age. There have been studies linked to the increase in brown fat with lower levels of obesity and healthier levels of blood sugar and blood lipid, leading to the suggestion that brown fat may also be helpful in preventing obesity and diabetes. The researchers found that the mice on the high-fat diet that also had ursolic acid ate more than the other mice. They also gained less weight and their blood sugar levels remained normal. The same group of mice had increased skeletal muscle and brown fat, which increased their strength and endurance, which lead to increased calorie burning, which in turn protects against diet-induced obesity, pre-diabetes, and fatty liver disease. Over 50 million people in the US are obese and 25.8 million people have diabetes. It is important to stay healthy whether that means losing weight or staying fit. There are many weight loss options out there including weight-loss surgery. To learn more about weight-loss surgery options attend one of our free bi-monthly bariatric surgery seminars on the first Thursday and the third Monday of every month. Register for this free weight-loss surgery seminar today!